For a movement based on the principles of social equality, left-wing people too often rely on harmful body shaming to criticise their political opponents, instead of targeting what is truly ugly – their ideas and beliefs. Don’t get me wrong, this is a tactic used by many on the right too. But we should be holding ourselves to much higher standards than that. Left-wing politics advocates for the removal of a social hierarchy, for body positivity and for bodily autonomy, be that through access to abortion, transgender healthcare or a multitude of other issues that give people ownership of their own bodies and appearances. Yet, when it comes to our political adversaries, this completely goes out of the window. When I think about Trump, I think of jokes about his tiny hands, his combover or his chubbiness. I think about the infamous naked statue in New York, where he was depicted with a large belly and genitalia that was lacking (to say the least). From the start, that statue was destined for internet fame. It was plastered across my Twitter and Facebook feeds for weeks, and many of my left-wing friends found it hilarious, but it just left a sour taste in my mouth. As a fat, trans-masculine person, it cut right down to my deepest insecurities: this fake body mirrored my own. For all the difference, it could have just been me standing naked in Central Park, and so everyone laughing at it or calling him ugly/fat/evil must think that about me and my body too. The artist’s intent was to comment on Trump’s ego and lack of compassion – they attached a plaque that stated ‘The Emperorhas no balls’ to the bottom. But there are so many ways that this could have been done without creating a very public and physical manifestation of fat hatred and transphobia in the name of political humour. Body shaming does not provide nuanced criticism of the fact that Trump is a white supremacist, that he is systematically removing legalprotections for trans people, Muslims and immigrants or that he is a well-documented abuser. It simply makes fun of his appearance and isolates those who look like him. The fact that you don’t find Donald Trump attractive does not matter. What matters is that he is genuinely dangerous for America, and his right-wing ideology is inspiring similarly minded people across the globe to become more vocal in their beliefs: across the UK, letters urging people to ‘Punish a Muslim’ are spreading; the far-right group AfD is now the third largest party in the German Bundestag; and a Jewish Holocaust survivor was recently killed in a violent anti-Semitic attack. Misogyny is rife among left-wing political commentators too. Lena Dunham is routinely shamed for not being conventionally attractive or not wearing ‘feminine’ clothing, rather than for the fact that she sexually assaulted her sister; that she regularly perpetuates racism (she once tweeted the words ‘African American Rodent’, and victim blamed a young black girl); or her mass objectification of the LGBTQ+ community (such as multiple queerbaiting kisses in her TV show ‘Girls’ and many tweets/speeches where she states that she ‘wished she was gay’, or uses her sisters lesbian identity to appear more #relatable). Sarah Huckabee Sanders was called a ‘chunky soccer mom’ by David Horsey and was fat-shamed in Saturday Night Live sketches, rather than being questioned on her support of Donald Trump and his administration. Images of Theresa May pulling faces while walking or comments about her age are found hilarious, while very few actively criticise her for systematically voting against protections for minority groups, or harmful immigration policies as home secretary. We continually advocate for the removal of discrimination and inequality in our society, but this is little more than hypocrisy when you acknowledge the sheer amount of body-shaming, ableism, fatphobia, transphobia and misogyny that we perpetuate when criticising others. When right-wing people body-shame left wing political figures, it is immediately called out and condemned, yet we remain silent when we do it ourselves. Nobody deserves to be body shamed, even if they are bigots. Body-shaming does nothing to condemn or change people’s beliefs – it simply puts people’s backs up and isolates those who look like them. 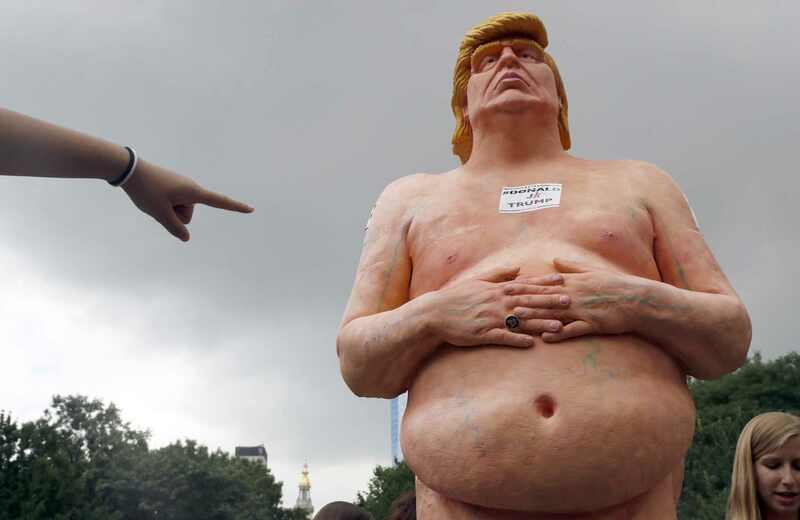 So in future, before sharing that ‘hilarious’ meme about the size of Trump’s d*ck, maybe consider if that is the real reason you dislike him, or if you are just using body-shaming as a funny alternative to actually condemning his actions. The left-wing movement will never be radical, effective or inclusive unless we actively condemn all forms of bigotry, not bodies. Brilliant blog I totally agree.